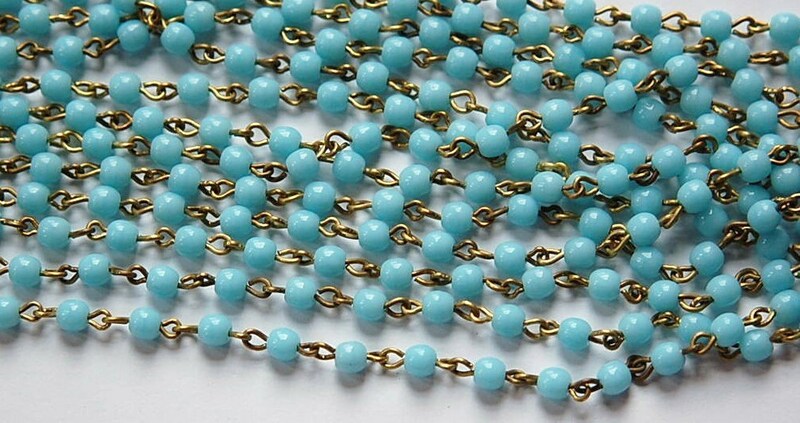 This is glass beaded chain that was made in Czechoslovakia. The beads are a light blue blue glass. The links are raw brass. The bead measures 4mm. There are approx. 35 beads per foot. This listing is for 1 foot. If you would like a longer piece please convo me for a reserved listing. Perfect! I made a bracelet for an antique doll and she loves it. With the dark, brassy wire, they have a great vintage look to them that really lends itself to antique-style jewelry fashions. Love the quality of these beads! Love all my things from your store! Love these. Highly recommend this seller.